In the presence of DMI, the spontaneous release of radioactivity was a constant fraction of the tissue radioactivity from slices of the hypothalamus. Exposure of tissue slices to the highest concentration of either (-) or (+)-NE induced a moderate increase in the spontaneous outflow. There was a small decline in the fractional release in four successive one-minute exposures to 25 mM K+. Increasing concentrations of (-)-NE dose-dependently reduced the overflow induced by K+. A concentration of 3 ^M of the (-)-enantiomer was necessary to inhibit the fractional release by nearly 50%. (+)-NE was considerably less effective in inhibiting the K+-evoked secretion of tritiated transmitter. At the highest concentration of (+)-NE, there was a significant degree of inhibition achieved. As shown in Figure 3, a similar picture emerged when the inhibitory effects of both norepinephrine enantiomers were compared in the two systems, with the values being corrected for the variation in the corresponding control stimulus. 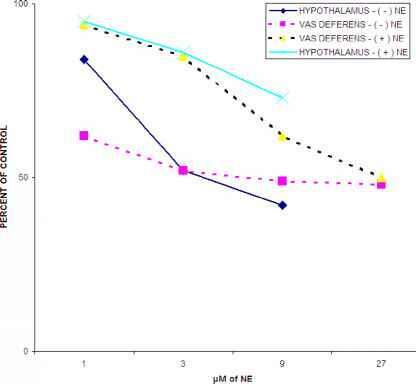 In the both hypothalamus and vasa deferentia, the same concentration of (-)-NE was necessary to inhibit the release by nearly 50% (3 ^M: 46.9 ± 5.2% in hypothalamus and 46.9 ± 8.5% in vasa deferentia). 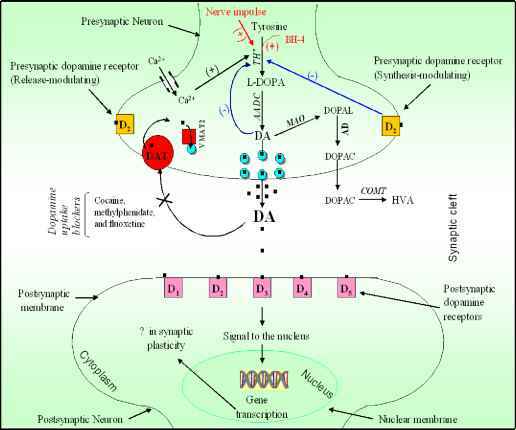 It required a 9 fold higher concentration of (+)-isomer to achieve equivalent inhibition in the vasa deferentia, with comparable results for the hypothalamus. Figure 3. Comparison of the effect of (-) -and (+)-norepinephrine on 3H-transmitter release induced by K in central and peripheral neurons. Ordinates: fractional release induced by K expressed as a percentage of the first stimulus (Sj). The values were corrected by the variation in the corresponding stimulus in the presence of DMI alone. The tissue slices were stimulated by 1- minute exposure to K , 75 mM (vasa defernetia) or 25 mM (hypothalamus).Abscissa: (-)-or (+)-norepinephrine (NE) at the concentration which is indicated was added 8 min before stimulation with K . Each point represents the mean value of four to seven experiments.